Well, sort of. Still going back and cleaning things up, changing things a bit but it’s a start. LOTS more to do. Start the “Favorite Droppings” page, finish the gear pages, get some gear lists together, finish the “Links of Interest” page, BLAH, BLAH, BLAH. Oh, and the “Future Trips” page. Working up some plans there (more like dreaming up some plans). And I’m sure I can come up with plenty of material for the “Smelly Droppings” page! As for the “Projects” page, I’m hoping to do a full write up with pics on the one-pole cuben fiber mid project that will take the place of the Gatewood Cape. 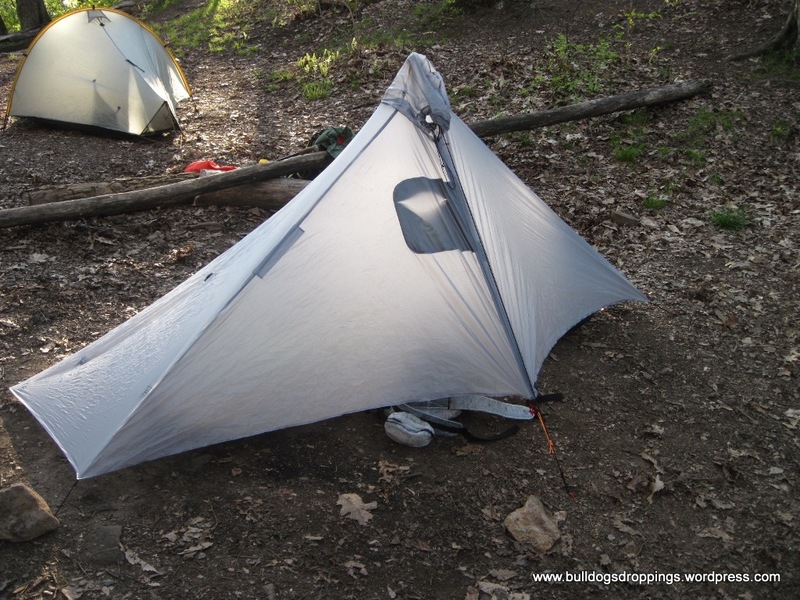 I love the one-pole mid concept and the Gatewood is a cool little shelter but I’m wanting to see if I can get a bit more room and full bug screen without gaining any extra oz’s. But that’s several months away. Just a teaser though! Loonie and I are headed back to the park next month. On the itinerary is one night at site 13 and Gregory Bald and a two night loop in the Lynn Camp Prong area. Loonie is excited about getting some great pics with her new Canon T5i. Might be a bit early for the rhododendron and flame azaleas to be in full bloom up on the bald. Fingers crossed. We tried to land a spot at 24 up Little River to catch the synchronous fireflies but it was full. So, our second night on the loop out of Tremont will be at site 27 (Lower Jakes Gap). Elevation looks to be over 3500 ft. and the park service tells me that might be pushing it to see any. However, site 27 does put us in a decent position to do a night hike down to Cucumber Gap and the Little River area so we’ll see if Loonie’s up for it. Here’s hoping for beautiful weather regardless!!! Also on the agenda, time permitting, is a day hike to the Avent cabin (just off of Jakes Creek Trail on an unmarked trail). Maybe back to Porters Creek up in the Greenbrier section to see if any wildflowers are still hanging around. And, if we can squeeze it in, back to Cades Cove to try and catch some bears. That’s a lot to try and cram into a week.